This region was the focus of our 2005 travels in Italy and we returned again as we really enjoyed the Region for its sights. It is not on the A List for North American tourists so we never felt that we were in locations being over-run with tourists. The towns have incredible architecture. 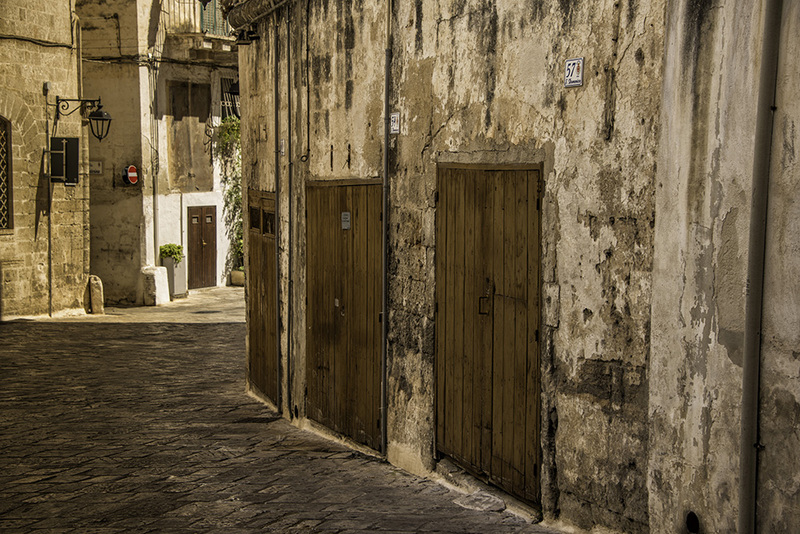 This part of Italy is known for Baroque architecture. 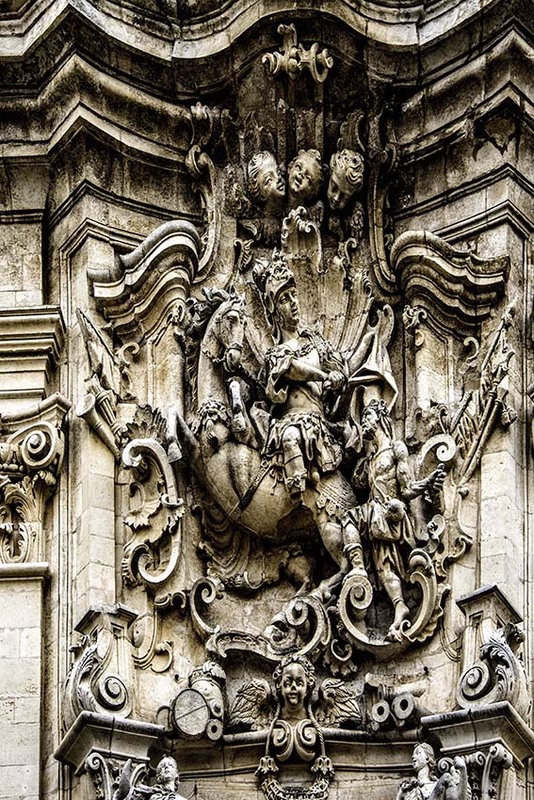 This dates back to the 16th Century and the facades of buildings have almost a theatrical look. It is intense and dramatic. 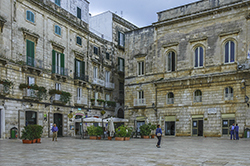 One style that is noted is what is referred to as Sicilian Baroque, or that found in Naples, or the city of Lecce here in Apulia. That was one of the pulls to visit the Region. Of, when you are done looking at the buildings, the food and wine is of this region is excellent. There are over 25 types of wines from this region. The long and relativelynarrow region stretchs along the Adriatric for some 405 kilometers. 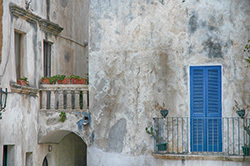 In 2005 we drdove from the Amalfi Coast, leaving at 9:00 am and arrived in Apulia a little after 1:00 in the afternoon - there are good autostrada routes to take you across the country. Starting at the north and working you way down is another otpion. 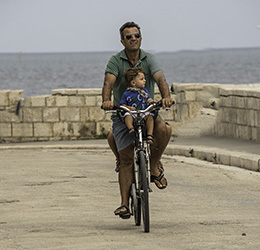 We returned in 2015 when we stayed for a week in Apulia, not far from Polignano-a-Mare. Information on that trip in included in one of Trips of Note. With always a reason to go back, on our 2005 trip we had terrible weather. Rainy and cold. One morning we woke and over our cafe decided we should be enjoying our Italian visit more. The weather forecast was for solid rain over the week, so we cancelled travelling on to the Garano Peninsula -- we would return in a few years for that -- and drove up to Orvieto where the weather was much warmer. 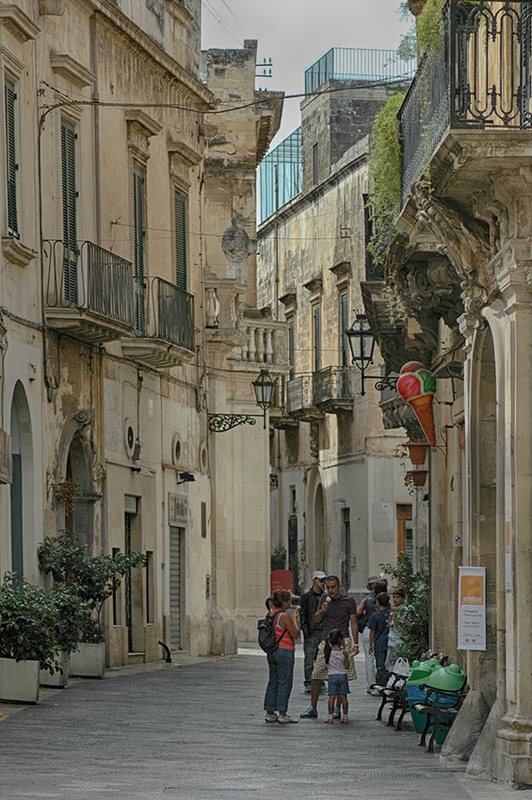 Lecce is considered one of the most scenic towns in all of southern Italy. 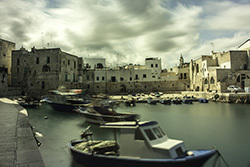 In 2005 it was out first destination in the Apulia Region. Known as the "Florence of the Baroque" the town has buildings that are just covered in baroque facades. Working with a soft sandstone, artists created a local Baroque style - known as barocco leccese. Very ornate and intricate. 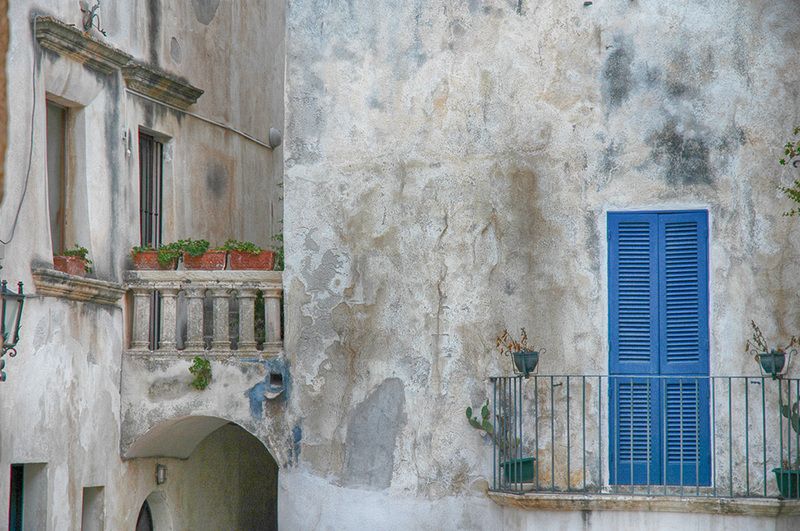 We found the style to be similar to what we saw in the town of Noto, in Sicily - another town not to be missed. 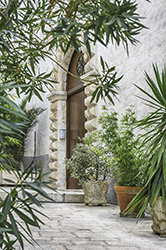 , Pietra di Lecce is a type of sandstone has a characteristic of being soft to carve and then hardens with time like granite. There are plenty of impressive buildings. The Basilica di Santa Croce took over a century to complete with work started in the mid-15th century and not finished until 1680. 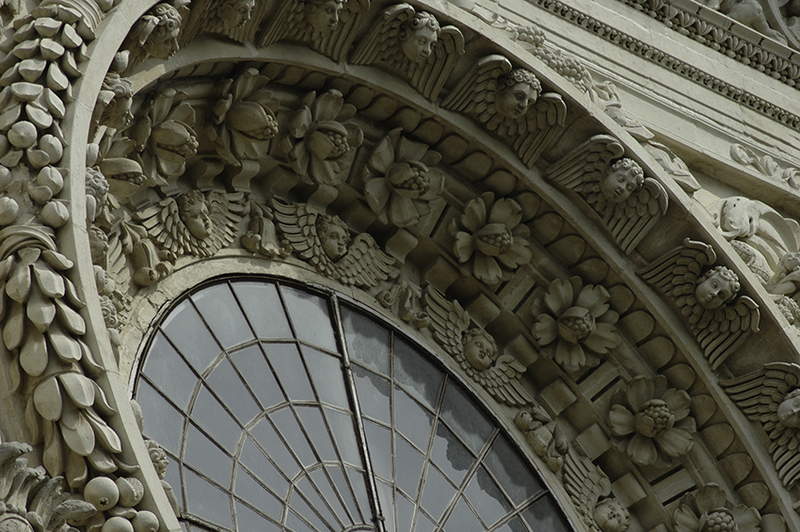 The upper section of the facade is a classical example of famous artist Antonio Zimbalo. Interesting decorations for a church as they include both pagan and Christian symbol: dragons, cherubs, winged Harpies, and pot-bellied mermaids. 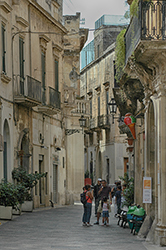 Originally a Messapian town, Lecce flourished under Roman rule. 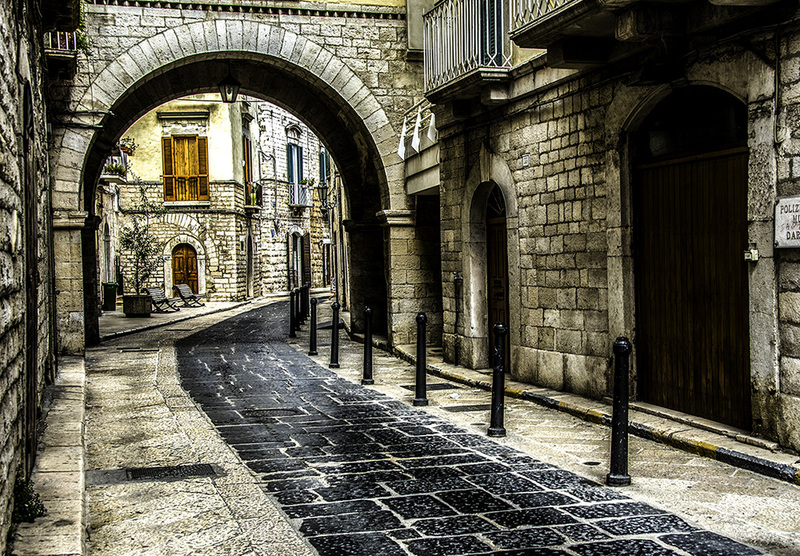 It was in the Middle Ages, however, that the town made a mark for itself. It was the centre of the Salentine peninsula which was somewhat of an independent country. Much of the Medieval and older structures are gone. 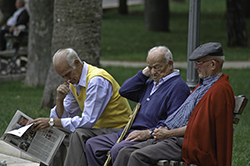 The town was prosperous during the later years. When the Spanish controlled the area. 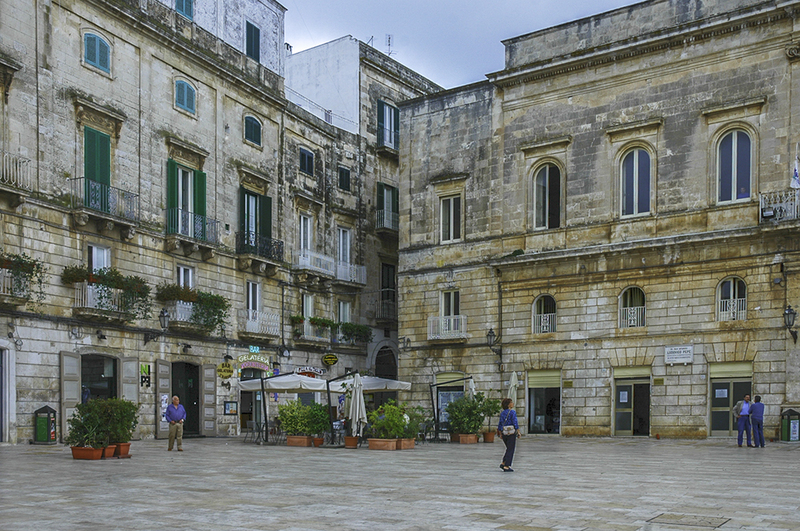 One of our first stops was the Piazza San' Oronzio. Here, in 1901 when workers were digging a basement for a new bank, they discovered a roman amphitheatre with seats for some 15,000 people. This dates back to the 1st century BC. The remaining level of the roman amphitheater is in pretty good condition, and you just know that significant remains continue under the buildings to the left. The Sedile is a small glassed-in-pavillion that was built in 1596. The church in the Piazza is that of the Santa Maria della Grazie. Other buildings around the Piazza are modern, but the amphitheatre and the Sedile make this piazza certainly worth a look. Just off to the right is a column which originally stood in the town of Brindisi to mark the end of the Appian Way - the famous Roman road to Rome. Lightnigh knocked the original column in Brindisi down. The town just left it there and the city of Lecce bought it, and had it shipped down, and now it stands in Lecce. Go behind the Santa Croce and there is a peaceful park, the Giardino Pubblico and the castle built by Emperor Charles V.
The Piazza del Duomo is easy to miss. 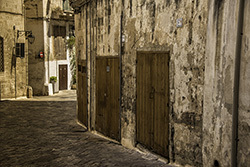 Walking down the narrow streets keep your eyes open as there is one one small alley, off the Via Vittoria Emanuele, as the only way to get into the Piazza. 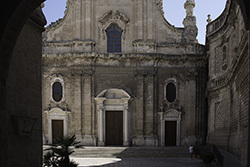 The cathedral has two different facades with the most ornate facing the Piazza. 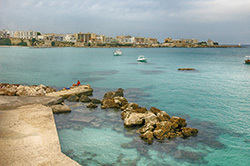 On the coast, about 38 km south of the town of Bari is Otranto. 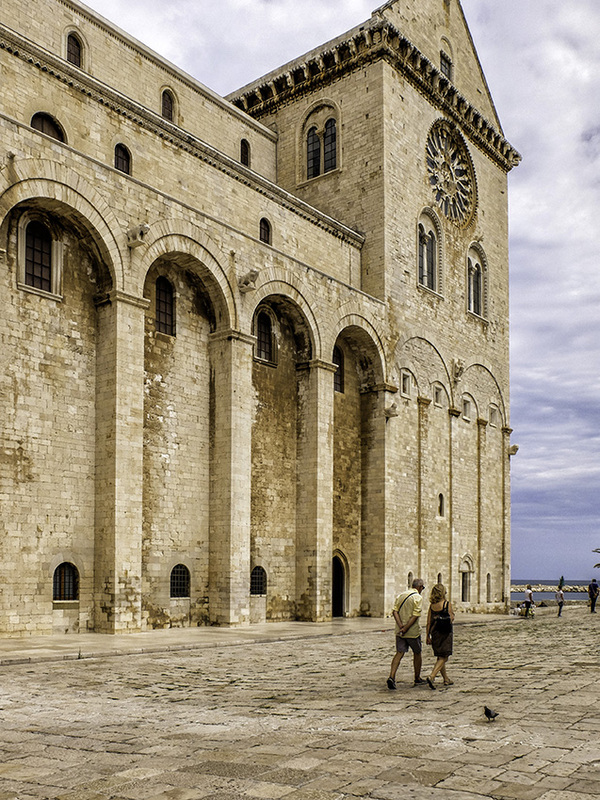 At one this this city was the next in importance to Brindisi in terms of Rome's trade with the east. We found it to be interesting and the night life in the old section of town means there is always a restaurant available. In the old section there are connecting small allays to walk with numerous stores and restaurants. The Cathedral dates from 1088. After the fall of the Byzantium around 1480 the town was sacked by a joint Turkish and Venetian Fleet. The Turks were a little more violent as they slaughtered the Christians. The bones of the 560 Christians slaughtered were placed behind glass along the walls in the Chapel of the Martyrs. As you stand in the chapel, there is glassed in cases that rise to the ceiling are sculs, arms, rib cages etc. The church also has an impressive mosaic floor that dates back to 1165. What seemed odd is looking at this detailed mosaic floor that is hundreds of years old, and three are chairs with wooden legs all over the place being moved across the floor like it was cheap tile. Walking on the floor is like walking across a stone tapestry. 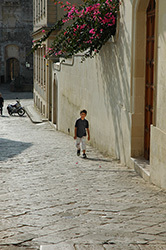 The historic centre has small winding streets - pedestrian only. With mainly white-washed buildings the town has a feeling of Greece. This is no sleepy little town. The stores are open well past 10 at night. One restaurant, is obviously the place to eart, and after an half-hour wait we do get a table and have just an incredible piazza. What a great relaxing afternoon we had here. It is 40 kmm south of Bari. We found a parking lot just outside the walls, and then walked into the centre along the protected port. We much some kids and with our broken Italian, and their broken English, we had a pretty good conversation. Yes, that is about as exciting it gets here. This is not a tourist haven and you can just walk about and enjoy the town, the coast and the beautiful blues and greens of the sea. 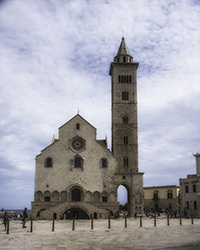 The cathedral, the Basilica of the Madonna Della Madia has an elegant facade. Inside the are multi-colour marble creating a great visual effect. The Castello Carlo V still stands. It dates back to 1544 and was a rrebuilt of an older castle which was destroyed in 1414. 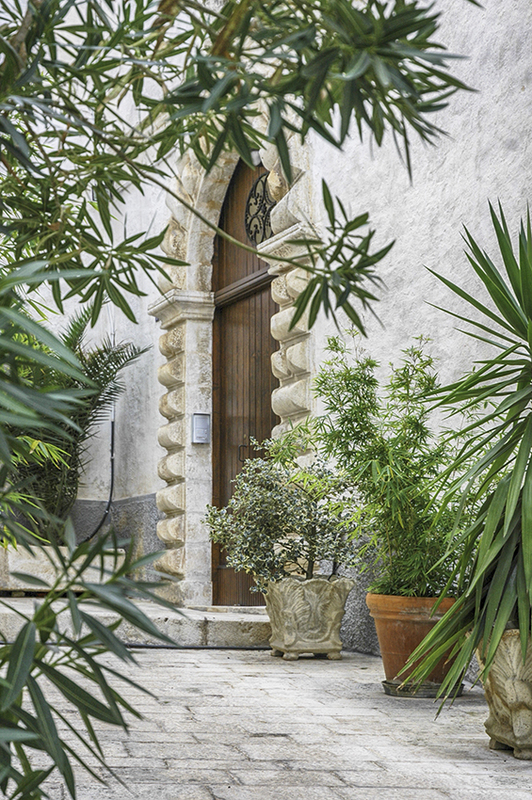 We did not get to it, but the Palmieri Palace is located in the historic centre of Monopoli. Built in a lavis Baroque style. 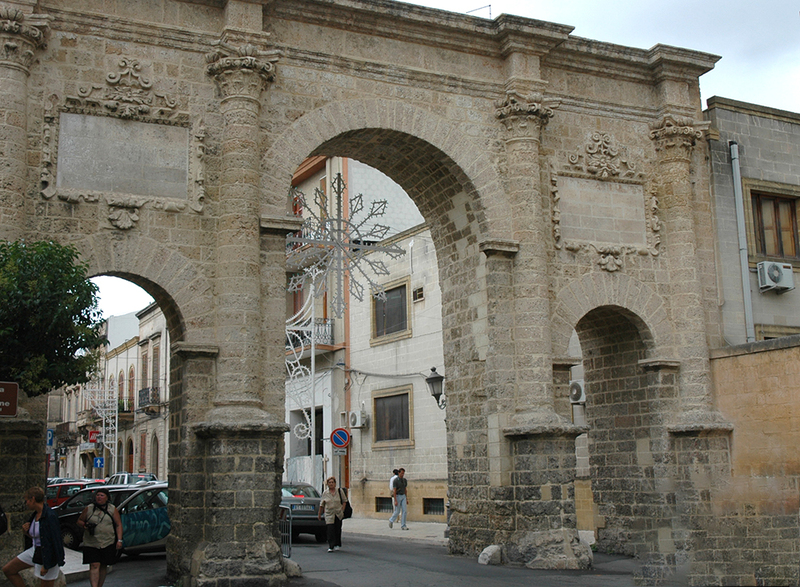 The name Francavill stands for free city, as it was granted its freedom my either Phillip I of Anjou who was also the Prince of Taranto or King Ferdinand IV - depending on what source you read There are a number of 14th-18th century palaces in the town. Part of the walls remain and with three of the original gates are still intact. Lots of baroque facades in this town also, although not to the degree in Lecce. 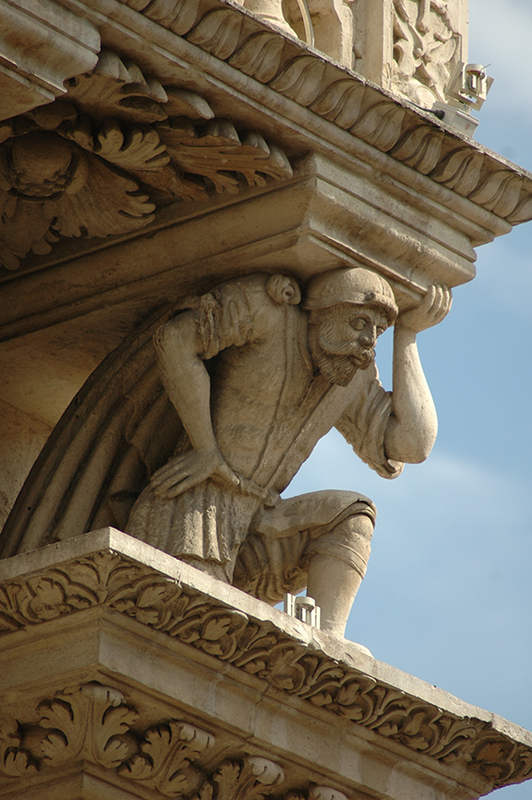 The most noted monument is the 15th century Palazzo Imperiale/Castello. This is one friendly place. When we asked for directions not only were we told where the Palazzo would be found, but the gentleman walked with us to make sure we were heading in the right direction. 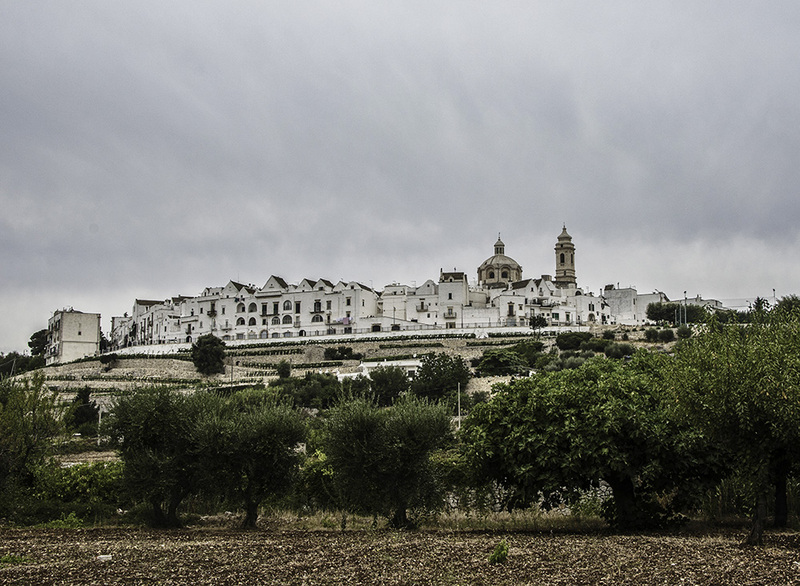 Martina Franca is another showcase for the Baroque and rococo architecture style. Philip of Anjou expanded the town, built the wall for protection. At the time there were 12 square and 12 round guard towers. It must have been quite the sight. He also gave the down a number of franchises and that is what the name, franca, is based upon. 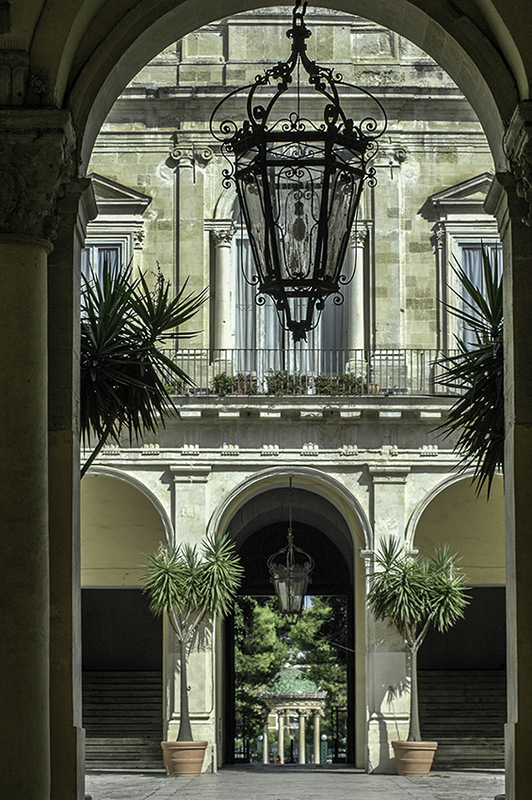 The Ducale Palace, dates to 1668, was built on the foundations of an ancient castle of Raimondello Orsini from 1338. In front is the Fontana Of the Dolphins. 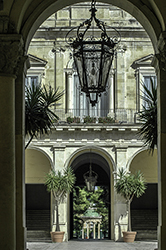 The palace of the Caracciolo Family had over 300 rooms. It now houses historical archives although and you can walk through many of the rooms - some with lavish paintings floor to ceiling. There was, of course there always seem to be, a wedding taking place just as we approached the Cathedral. Think of blue clear water, rocky beaches, grottos. 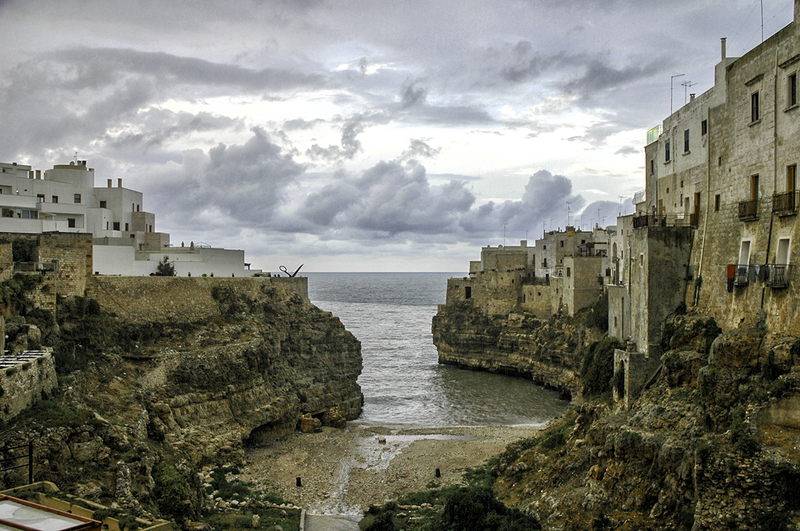 Polignano a Mare, on the east coast of Italy, just south of the city of Bari. The old town holds a dramatic location on cliffs. The town hands out of the water. Our, Hotel Covo Dei Saracreni was right there on the cliffs - it is one of our Great Places to Stay. The buildings are all whitewashed, there is a stunning cathedral. The wines of Apulia, like its food, is on the strong and full-bodied side and held in high esteem since Roman times. We also had a very good meal one night at a little restaurant (see Great Places to Stay) where the table was set with ceramic dishes, we had a great house aniti-pasto, a pasta and wine. 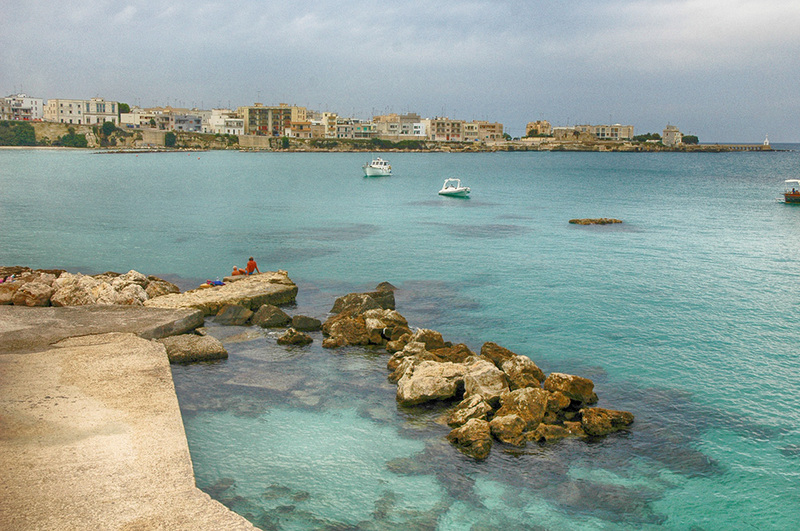 We used Polignano a Mare as our base to tour the area. It is located just a minute or so from highway S16 - one of the Pulia Autostrada's so within minutes you can off on a road moving at a good clip. One of our outings was to go to Alberobello and see the Valley of the Trulli - the cone-shaped stone buildings that abound in this area. Alberobello has over 1,000! Personally I enjoyed the drive through the country-side and seeing the Trulli houses more spread out than the concentrated effect in Alberobello. 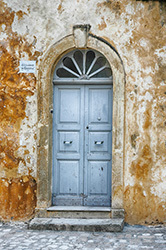 Our friends Chris and Carmen Grant enjoyed the houses in Alberobello and even went into some that were open for tours. The Trulli are round houses with cone tops that are found only in a few villages in his Region. They are built of uncemented stones, built row on row. 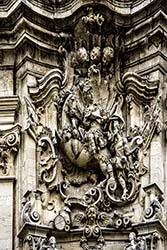 At the top there is a decoration that has some rebellious or magical meaning. 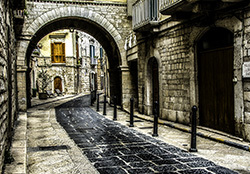 At one time it was thought they were built in the Middle Ages in accordance with the demands of Ferdinand I of Aragon. He declared that peasants were not allowed to build permanent homes. Since the stones had no cement, in theory they could be taken apart and moved. I find it hard t think of those stone houses being dismantled and moved, but I never lived in Medieval times! The caves were discovered in 1938 and today you can take one of two tours. The short tour, 1 km in length and the long tour, which goes for 3 km. Take the long tour as it is a two hour walk to enjoy. The Grotte di Castellana are north on highway S172 outside of the town of Putignano. The tour follows a path through a network of caves that were created by underground rivers. It takes about two hours to walk the 3 km route. A guide is with you and if you don't want to wait for an English tour do that as you will get the impact of the caves regardless of the language. 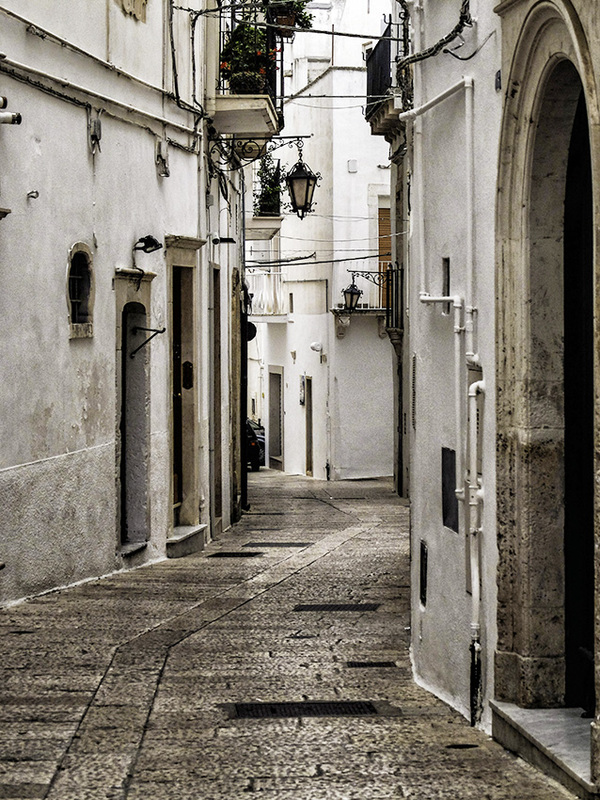 This is known as the Citta Bianca, a white washed town located high on three hills. 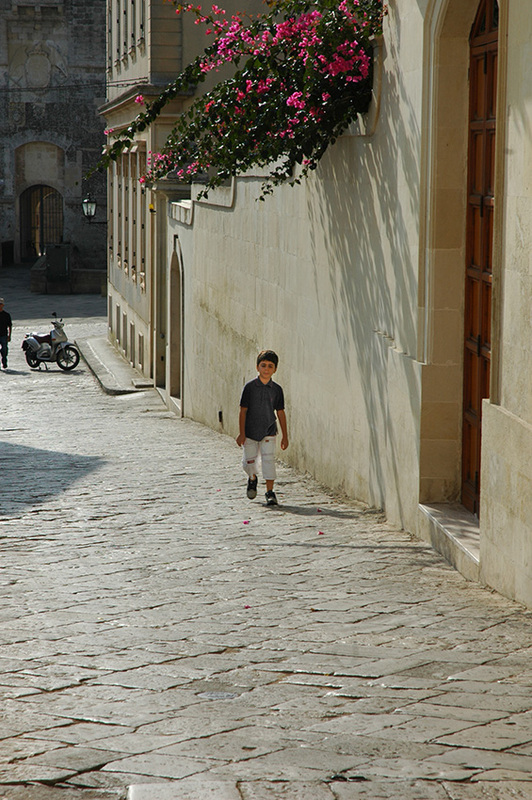 There is what you would expect, narrow streets and lots of stairways. The white-washed look is most impressive as you approach the town. Once in, especially the area around the Cathedral, is the typical narrow streets and buildings with great baroque façades. Walk up to the 15th century Gothic Duomo. The façade with columns, doorways and rose windows. The interior is baroque in character. The incredible rose window has 24 external arcades, they stand for the 24 hours in a day. There then are the 12 internal arcades standing for the 12 months of the year. Christ is in the middle surrounded by seven angles heads that stand for the seven days of the week. 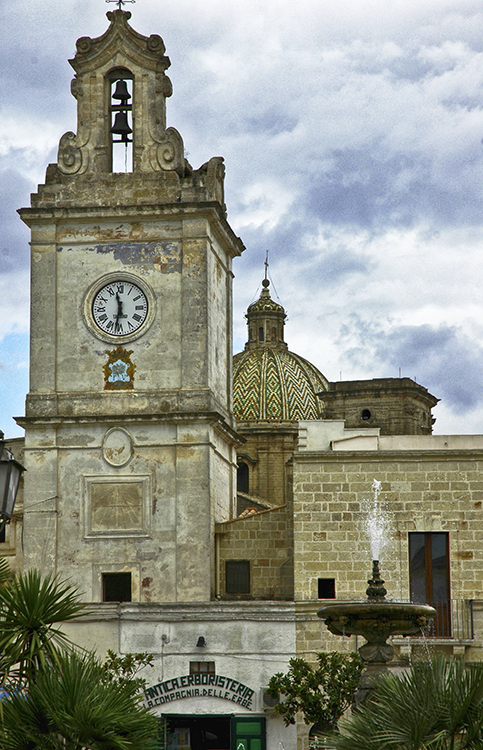 The Archeological Museum in the Church of S. Vito or Santa Maria is very interesting. The museum includes ancient skeletons. 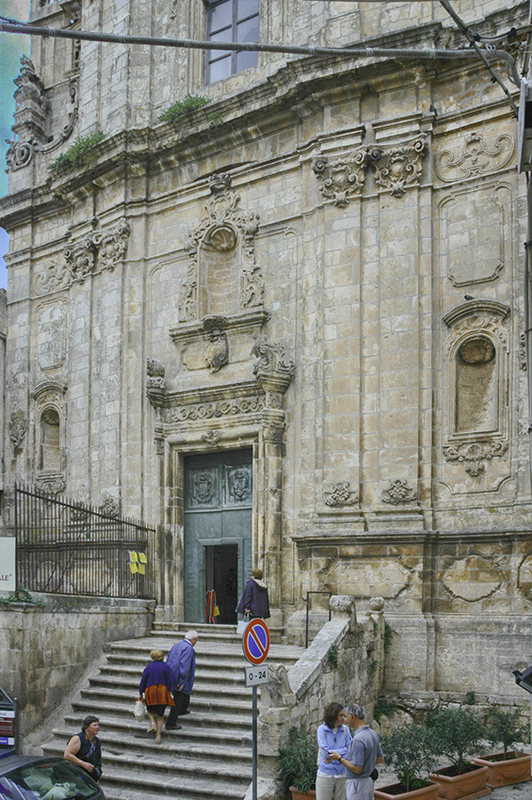 The church, re-built in 1750 replaced the original S. Vito which was destroyed by an earthquake in 1743. 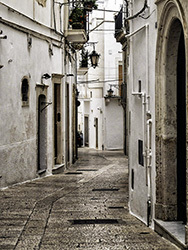 The rococo design is common for many of the buildings in the older parts of Ostuni. 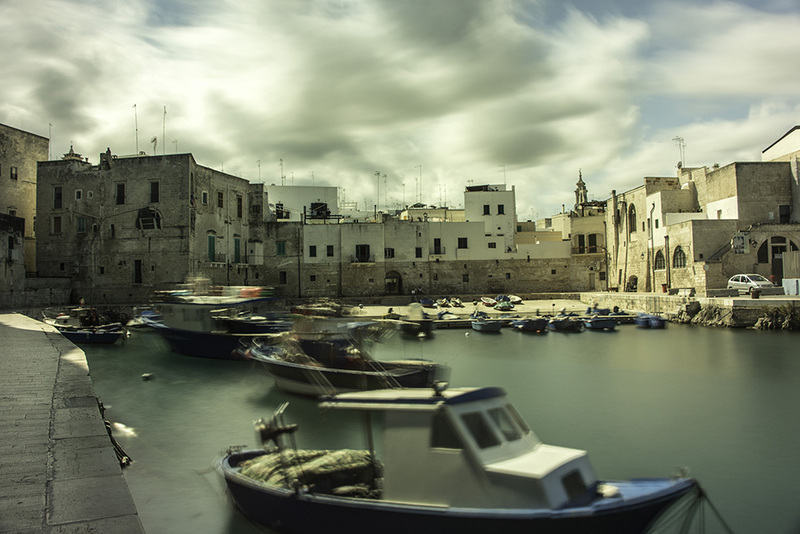 Trani is an historica fishing port about 40 km north of Bari. We arrived in this town on a Sunday, and while the retail business of the town was quite closed, the people and activity was at a high level. This is the town to walk and see and be seen! 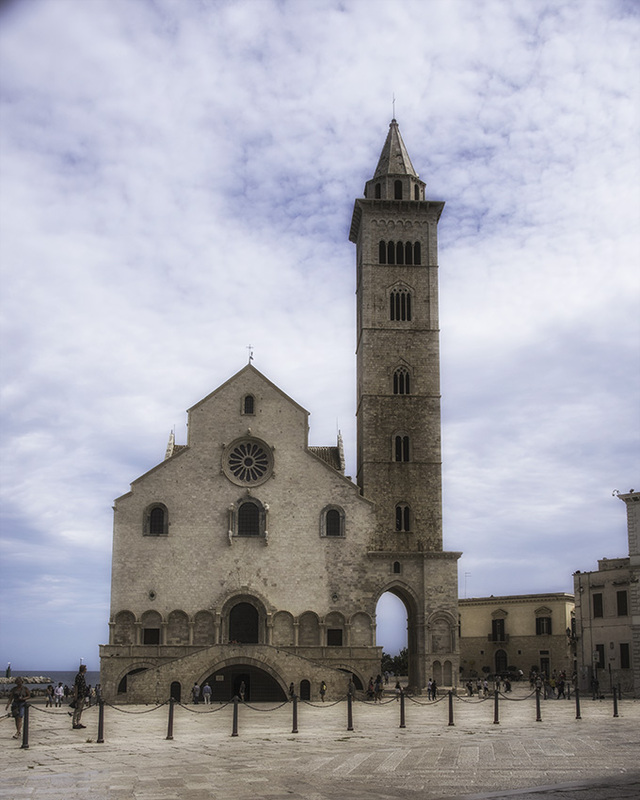 There are no "knock your socks off" tourist sites, although the town is scenic and Cattedrale di San Nicola Pellegrino has a bleakness about it that you won't forget. It was built in the 12th Century. 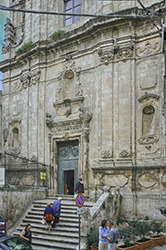 The bronze doors, now kept inside the church, are the works of a local artist, Barisano da Trani. The Castello Svevo still stands. It is just past the cathedral. It also dates back to the 12th Century. It was one of the many castles that were built by Holy Roman Emperor Frederick II. Gone are the days when it was used as a prison. There is not much to see inside, but it felt good to walk about it and there are good views to the sea. This is a spur on the Adriatic Coastline. The coastline has grottos and gorges (south coast) and the inner portion has plains and wooded areas. Along the coast line from Vieste to Mattinat there are numerous grottoes and caves, stone arches and vaults. 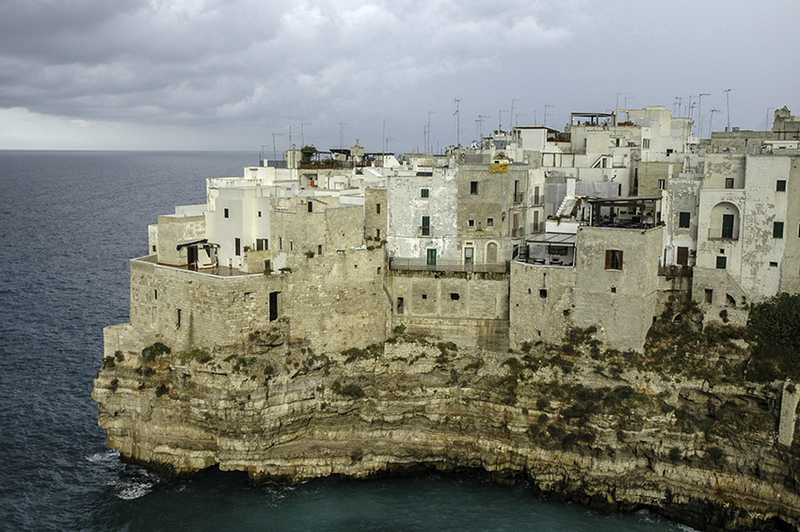 From Vieste you can take boat tours along the coast. Well worth it and this is perhaps the main reason for coming to this area. Peschici sit on a cliff and the town has both a scenic and somewhat trashy look. This is a vacation destination and the tourist and resort shops tend to overwhelm what could be a very scenic town. You will ask yourself "is it possible to hang just one more sign up here?". Vieste further along the coast is a good starting place to take one of the boat trips along the coast. The town has more of a "real town" feel.